I've been kinda out of the blogging mood lately.....so I will hand it over to a few pin-ables. The new Music City Center (the new convention center) is about 3 months away from opening. The grand opening celebration is happening on May 19 and May 20. There will be a free open house for the community with live, local music on both days and a free street party and outdoor concert on May 20. Once more details are shared I will pass them on, so go ahead and mark your calendar for this fun celebration! This week was road trip Saturday at my house. JK and I took a spur of the moment trip to Lynchburg, TN to tour the historic Jack Daniel's Distillery and lunch at Miss Mary Bobo's Boarding House. Lynchburg was just over an hour trip from Nashvegas, and being the downtown city girl I am now, the ride was half the fun. We spotted cows, barns and even had a tractor slowing us down. We got to the heart of Lynchburg a little before noon and quickly signed up for the next available tour. All of the tasting tours were booked for the day, but we were still able to take a non-tasting tour. We had the best tour guide, Wes. The process was surprisingly clean and our guide was extremely knowledgeable. After our interesting tour, we headed down the street to Miss Mary Bobo's for a late lunch. This southern charm has country cookin' down to an art! Usually daily they have 2 seating's, at 11 and 1, and lunch is served family style. They have a rotating menu, but I think we got the best one. As if that wasn't enough food, we had to stop by the Moon Pie General Store too! There were several really cute shops on the square. We had to take home a couple souvenirs. Aren't these coasters and personalized bottle of Tennessee White Whiskey perfect? I loved our Saturday and would recommend this trip to all of my friends. The distillery hosts free tours Mon-Sat from 9-4:30. And if you want to dine at Mary Bobo's call ahead for reservations early because they book up quickly. It's a beautiful day in Nashville today, and it's the weekend....perfect combo. Here's what's been shakin' in my world lately. Here are a couple pics from our Valentine's celebration. We made dinner at home, and then headed to the concert. The concert lasted til 12:30...so it was a late night for a school night :) JK surprised me with tickets to the Predators vs. Red Wings game next week! We have been to a ton of Preds games, but have never been to a game against our arch rivals, it will be a blast! I even got a treat from the library parking garage in downtown Nashville! Everyone was spreading the love. For Christmas, my parents snagged a DAT (day after thanksgiving) special on a Target Nikon camera. Here are a few pics I have taken and think it is just incredible! PSA: Have you backed up your pictures or computer lately? Due to a hard drive failure, my old laptop lost all of our pictures so I'm trying to piece together pictures I saved in random places. Yes, the first purchase I made was an external hard drive and now I'm an avid backer-upper! Remember when I got to play on the set of Nashville as an extra one day? Well, my episode premiered this week (I had no clue when it would be on air) and I was on the big screen for 2 seconds. It was in the first 5 minutes of the episode if you are looking for me. AND what you have all been waiting for......a picture of my TV. Now I'm basically an A-lister in music city. Recipe time again! I have been busy in the kitchen lately, and this one is JK approved, so I had to share. I'm back in my Puffy Muffin cookbook and I think my mom used to make a very similar chicken, so credit is probably due several places for this tasty chicken recipe. Combine all ingredients for chicken coating. Place chicken in mixture, cover, and refrigerate overnight, if you have time (not essential). 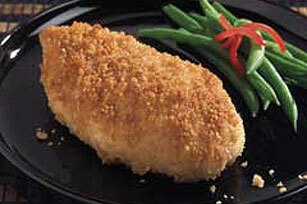 Roll heavily coated chicken in crumbled crackers and place in butter coated baking dish. Cover with aluminum foil to cook at 375 for 25 minutes. Remove aluminum foil and bake 25 more minutes, or until chicken is done. Have you made anything fabulous lately? We are headed to the Cannery Ballroom tonight to check out one of our favorite's Corey Smith! This and That, it's Friday!